There's something so alluring about a crackling fire. 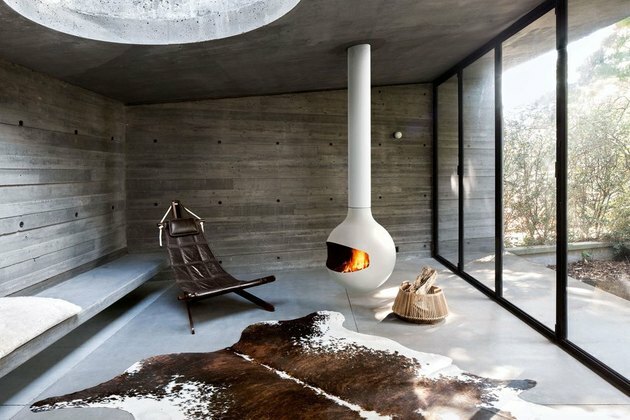 But not everyone wants a stone hearth interrupting their minimalist Scandinavian decor. 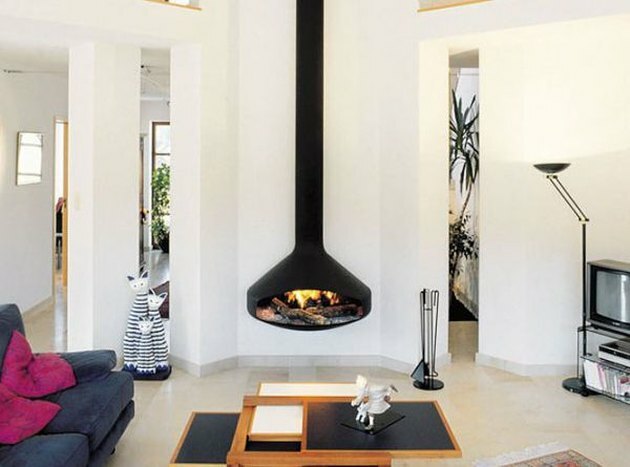 No need to worry: Fireplaces come in a multitude of shapes, sizes, and styles — you can even hang them from the ceiling. 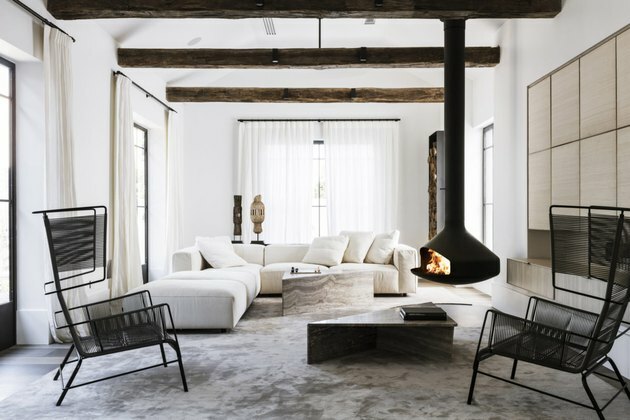 In fact, floating fireplaces are igniting the world of interior design right now, and we can't get enough of this hot trend. 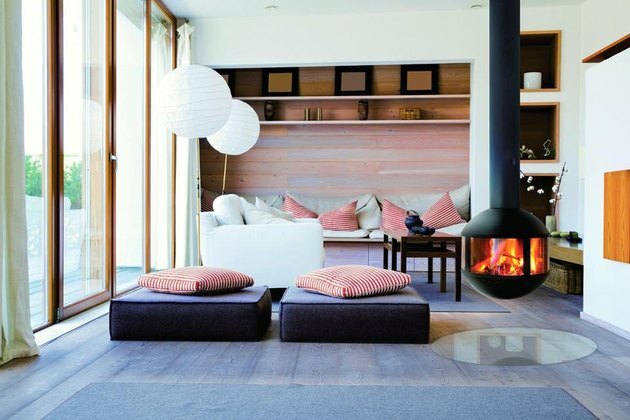 So, we've rounded up 11 cozy examples that will leave you longing for colder climes. 1. Go chic with black steel. 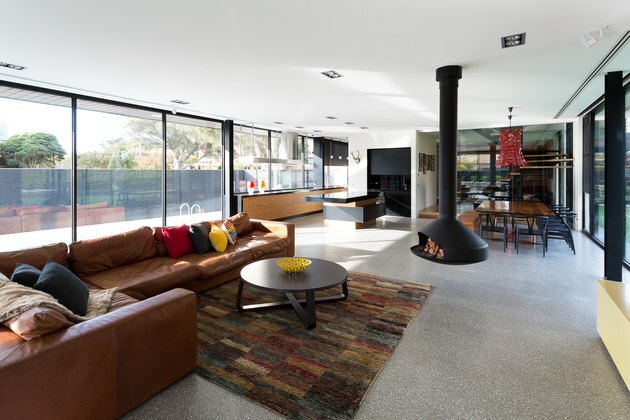 When working with an open-plan layout, a suspended fireplace can help divide living and dining quarters. 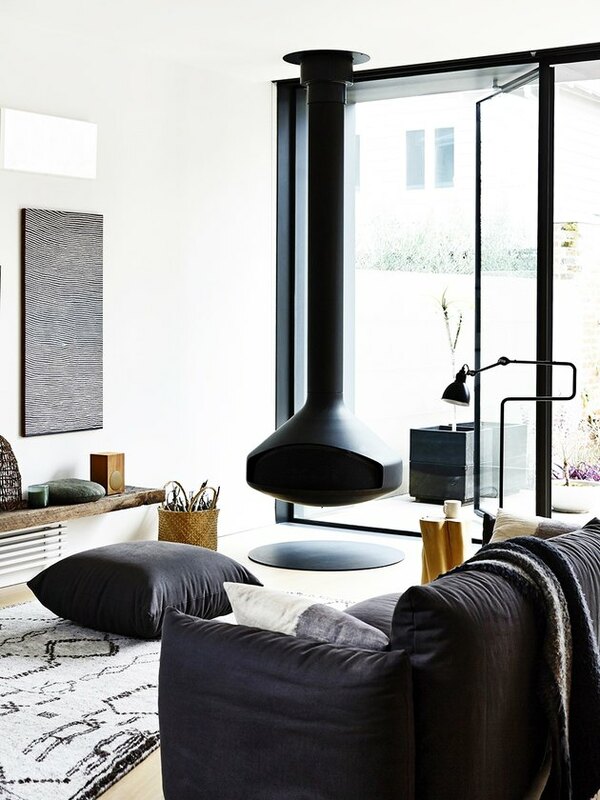 Interior designer Jasmine McClelland relies on this rotating black steel beauty to create more intimate spaces in this sprawling Melbourne abode. 2. Or, keep it light with white. There's a misconception that cave-like equals cozy. Not always the case! This dwelling features an open layout and floor-to-ceiling windows that bring in tons of natural light. 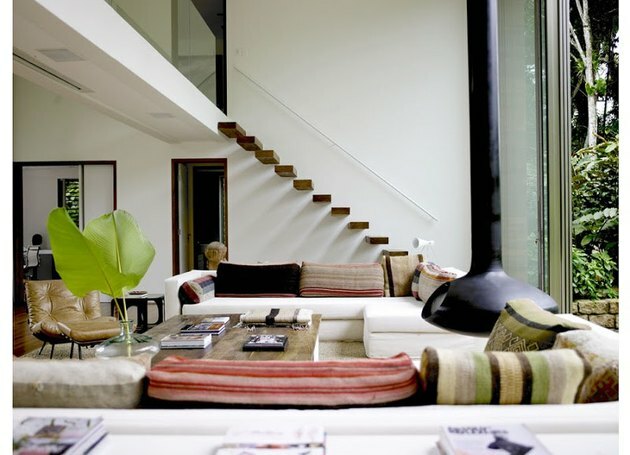 While the white, floating fireplace and cowhide rug amp up the ambiance. 3. Consider a slim profile. Short on square footage? Set your sights on this creation designed by Dominique Imbert. The slim, cylindrical profile is perfect for small-spaces dwellers — particularly those with a penchant for contemporary design. 4. Opt for a wall-hugging model. Dreaming of a hearth but don't have the funds for a full-scale renovation? This wall-hugging model is a genius way to create a focal point and heat things up on cold winter nights. Pair with a stone backdrop or colorful mural. 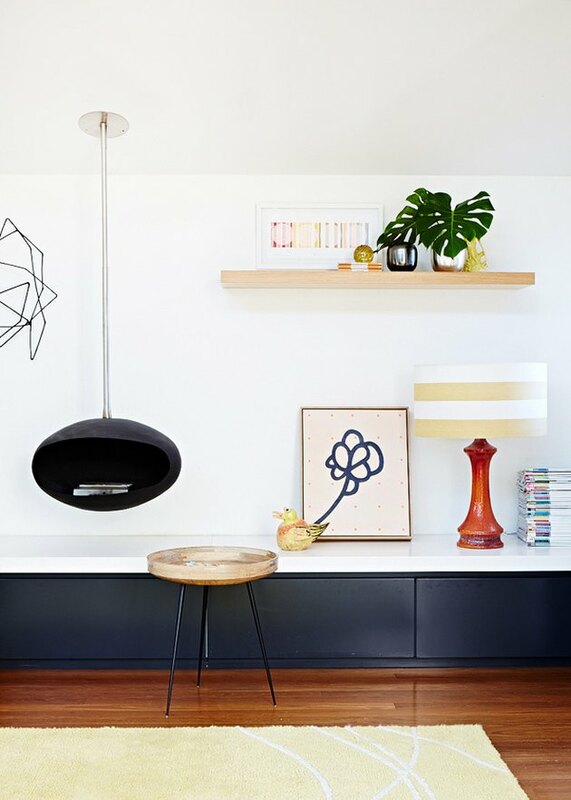 Just because you live in an apartment — or, really any type of compact domicile — doesn't mean you have to put your desire for a crackling fire on the back burner. (Get it?) This pivot stove provides warmth without stealing precious space. 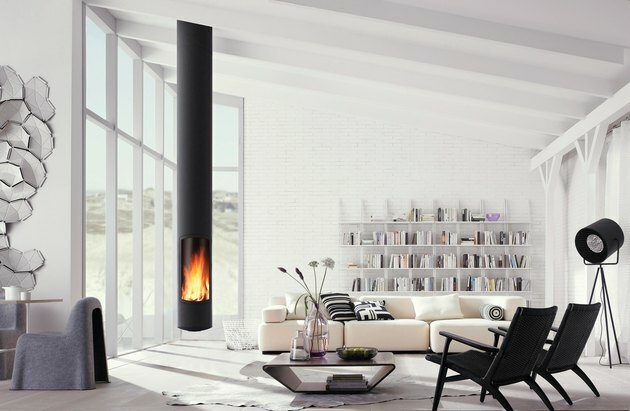 This suspended fireplace is perfectly proportioned for sky-high ceilings. As you're likely aware, keeping a large room toasty without blowing your budget can be a challenge ... but not anymore. 7. Rev up the contrasts. Varying shades of white and rich textures set the tone in this rustic, Scandinavian-inspired living area. Exposed wood ceiling beams lend a farmhouse-feel, while a floating fireplace and sculpted lounge chairs inject eye-catching contrast. 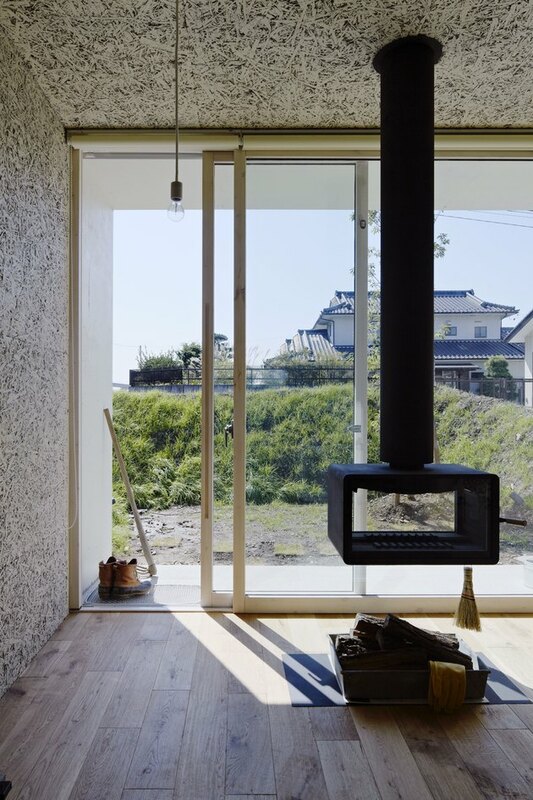 This small home in Japan designed by architectural firm Number 555 doesn't have any full-height walls, not to mention the design is very narrow. So it was important that the fireplace not take up a lot of space, but also be efficient enough to allow heat to flow throughout the entire house. Instead of a stone fireplace surround, this swanky living room designed by InForm seduces with a chic hanging fireplace, while black walls and low-profile furnishings amp up the modern appeal. Talk about drool-worthy. 10. Bring in retro vibes. Come fall, it's all about indoor fun. Take advantage of the cooler weather with an inviting entertainment area like interior designer Suzanne Gorman's living room — complete with comfy seating, floating shelves, playful artwork, and a retro suspended fireplace that's reminiscent of The Jetsons. 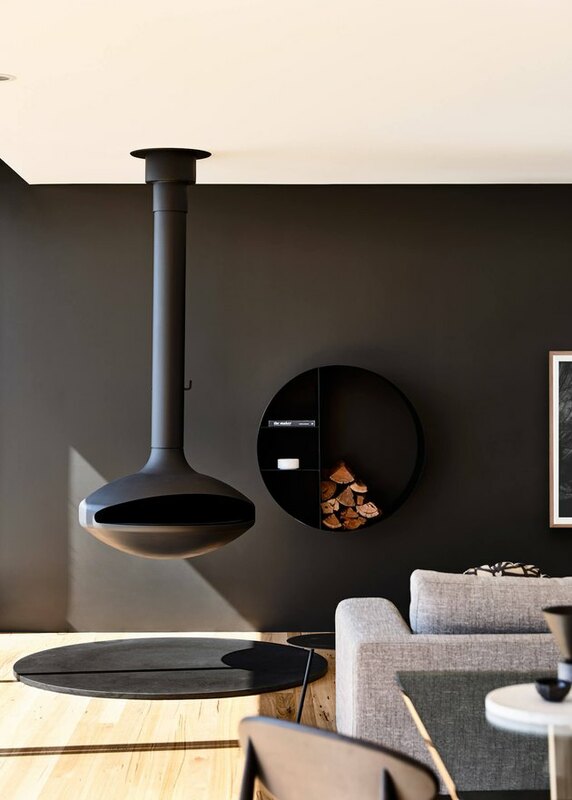 Scandinavian design shines in this Melbourne home designed by O'Connor and Houle, but the stunning suspended fireplace is definitely the star of the show. A cowhide rug and minimal furnishings round out the dreamy aesthetic.